The Issue: There are about 450,000 youth who are currently unemployed in Canada and the Baby Boomers will soon exit the workforce in greater numbers which will undoubtedly destabilize the job market. The XYBOOM Conference brings together 3 generations: X, Y and Baby Boomers to discuss and collaborate on the issue of Youth Unemployment and the Baby Boomer Exit. At this conference, interactive, facilitated panel sessions and discussions will be enjoyed by over 300 delegates including 150 youth (19-30yrs) and 150 industry professionals. Along with the dialogue of panel discussions, there will be case studies on the hiring strategies of businesses and an installation art piece sponsored by My Loud Speaker and the Gen Why Media Project. 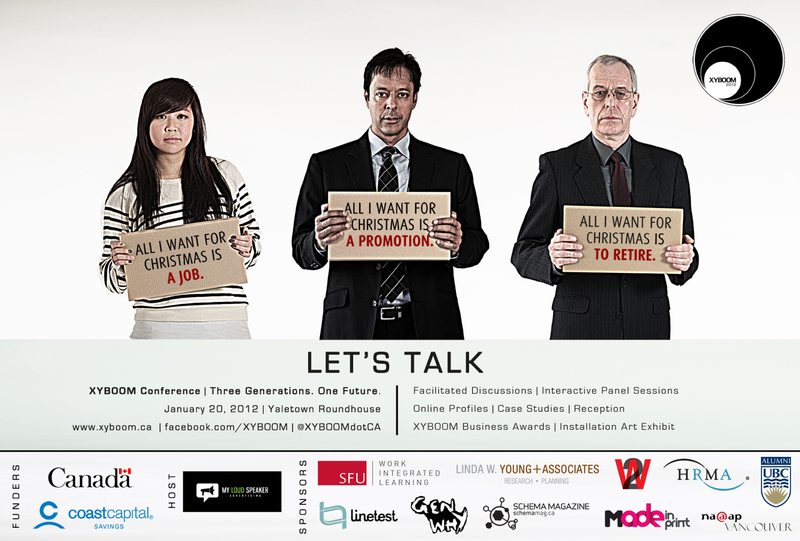 The conference takes place on January 20, 2012 from 9am-5pm at the Yaletown Roundhouse Exhibition Hall in Vancouver. You must register to attend. Admission for Youth is sponsored by Service Canada and for Industry Professionals, admission is $150 per ticket. For more information, visit xyboom.ca.